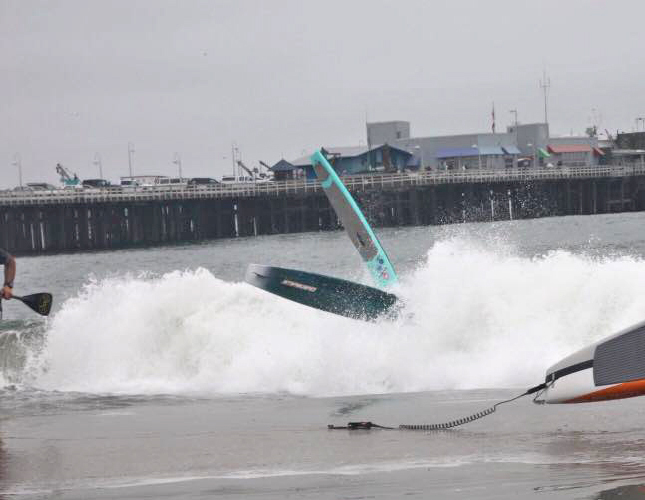 In brief: Mo Freitas (Focus/Quickblade) and Fiona Wylde (Starboard) have taken out the distance race at the 30th Annual Santa Cruz Paddlefest, with solid waves giving a small but elite field a good early season hit out. After a tight race that finished in just under an hour, crossed the line just seconds ahead of a Infinity ‘Speed Freaks‘ Giorgo Gomez and Slater Trout, with the lead trio having stuck together the entire race. Riviera’s Ryan Helm looked strong but couldn’t stick with the front pack in the latter stages, finishing a minute behind, while another minute further adrift was 404 junior Noa Hopper. Poenaiki Raioha, the 2014 ISA SUP surfing gold medalist, showed just how strong Tahitian paddlers are in general to cross in sixth place. In the women’s it was Fiona and Riviera’s Shae Foudy all the way, with the two young guns hitting the beach together. Literally. 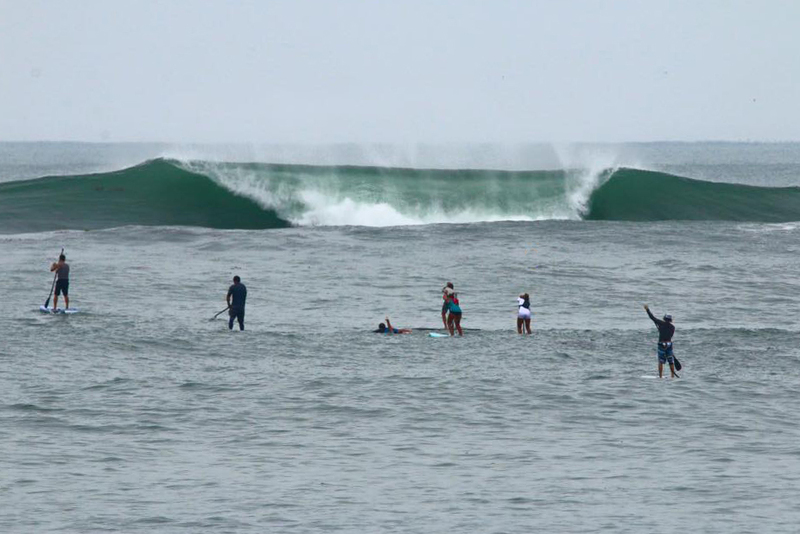 Fiona and Shae got taken out by the shorey, which produced this classic photo below. Fiona recovered fastest to sprint up the beach and take the win. The 30th annual Santa Cruz Paddlefest, presented by Starboard, featured both SUP surfing and racing (as well as kayak surfing). Giorgio, originally known as “just a surfer” but now clearly a threat in every race he enters, backed up his runner-up in the 10k with victory in the SUP surf contest, giving him the best overall performance of the event. Mr. Riviera, Brandon Rambo, was runner-up in the surf, Mo took third, while Giorgio’s team boss at Infinity, Dave Boehne, rounded out the high level final. Fiona placed second in the women’s SUP surfing, behind Annie Reickert but ahead of multiple world champ Izzi Gomez, which easily gave Fiona the top overall event performermance award.